← Haute cuisine: what mystery meat did the Explorers Club dine on in 1951? 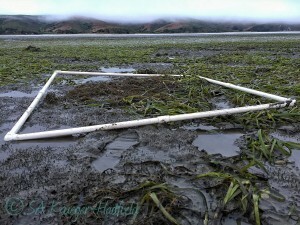 Eelgrass (Zostera marina) is the dominant seagrass in the northern hemisphere and provides the foundation of highly productive ecosystems that rival tropical rain forests and coral reefs in ecosystem services. Zostera isn’t really a grass, but a monocot, like a tulip. It absorbs nutrients and pollutants and helps prevent erosion in near-shore marine ecosystems. the sea on at least three independent occasions to form the basis of one of the most productive and widespread coastal ecosystems on the planet (Olsen et al. 2016). A team led by Jeanine Olsen, Thorsten Reusch and Yves Van de Peer, recently published the Zostera marina genome in Nature. This genome represents a huge advance for evolutionary ecologists working at the land-sea interface. Olsen et al. (2016) found Zostera had lost and gained genes that enabled it to journey back to the sea from whence it came. For example, the entire repertoire of stomatal genes were lost. Stomata enable gas exchange and prevent water loss in land plants, but something that is less important to a seagrass living underwater. Similarly, seagrasses also lost genes involved in the response to UV damage as its dimly lit water home which is characterized by low penetration of UV-B. However, with these gene losses, seagrasses have also have gained genes as they re-entered the sea, during what Olsen et al. (2016) contend is one of the most severe habitat shifts undertaken by any angiosperm. In order to cope with desiccation and osmotic stress, seagrasses have regained the cell wall compounds that were lost when marine algae transitioned to land. The Zostera genome fills in a missing piece of angiosperm evolution and will improve our understanding of biochemical pathways. This may have ramifications to important crop plants and improve our understanding of salt tolerance in these species. Seagrasses thrive over a huge latitudinal gradient in abiotic stressors from ice at high latitudes to the baking sun at lower latitudes. Understanding how seagrasses thrive across these environmental gradients will help us understanding how they will cope with environmental changes, such as ocean acidification or increasing seawater temperatures. The genome will help researchers to delve into exactly which genetic elements facilitate such high biomass production and resilience (Williams 2016). [The Zostera] genome-sequencing feat may have come just in time [as an] understanding of the genes that adapt these fascinating species to marine life can only help [conservation] efforts. This entry was posted in adaptation, bioinformatics, community ecology, evolution, genomics, plants and tagged Evolution, genome, plants, salinity, seagrass. Bookmark the permalink.